Lucy had to choose between Open 5 and a holiday (skiing) and picked the holiday. Hmm, I wondered who I might persuade to race with me. I asked Elizabeth who agreed! Hurrah, we were off, but due to other commitments, only for the day, checking in at a nearby BnB for the night and stuffing our faces in one of the many nearby pubs the night before. As we went to sleep, the wind rattled the windows. On waking, snow was falling from the sky and it looked wild outside. Dinner had been massive so I wasn’t really hungry at breakfast, which is unusual. Off to the start and we were almost last into the car park that was free, but which came with a walk to the hall. We wisely took all our stuff with us. Time seemed to fly by between registering and it being time to go. We had decided on the long drive down that it was better to bike first. This was Elizabeth’s forte and we would favour more of that and less of a run. Plus, if it was going to get cold and snowy we’d be warmer starting dry and the paths might be less obstructed. By the time we had come up with a vague plan, left the coziness of the hall, dusted the snow off our saddles and made it to transition we had 1 min to go until latest start. An easy beginning along the road before we turned off uphill on the rough stuff. I slowed to check for features and when / where to look for the control, and looked up to see Elizabeth already powering away. Despite recently coming off worse in van vs Elizabeth, you know that someone who can finish the Highland Trail 550 will be a biking force to be reckoned with. I worked really hard to catch up. It was properly snowy and fun over the top, then slippery on a descent where I lost contact and had to shout ahead to make sure we didn’t miss a control. A descent followed that I’d not be able to ride on a good day, but I remembered it from a previous event and was ready to walk. Then we were off along an easy track and all was going well. Into a small settlement and I was pondering our original route choice. We were making good time but checking the distance, realistically, that 15 pointer in Bradwell wasn’t worth it after all. Decision made without debate, we moved on quickly, heading straight through Hope and up the other side of the valley. We passed some 4×4 cars coming off road the other way, with one woman behind the wheel with a smile as broad as her face! Then we caught up Ali and Barbara. This surprised me, but I hardly had breath to explain that I had to keep up before the next control!! From there it got very snowy. It was hard to tell the difference between the track and the road, both covered in snow. I cursed not checking on the start line whether we could use the road and cut onto the path further up, so we took the path and were soon walking. Then we passed the cut through, easy to use, bother! Maybe cost us 5 mins at most though. It was slightly uphill and the wind was blasting us so hard that even when it looked vaguely rideable, it wasn’t, as the wind would push us off line and into a drift. Last race here I’d been just as cold, but with sleet instead of snow and we were at least riding then. As it flattened off and after what had seemed an age, we finally got back on. It was only now that we finally left behind a man out for a walk who we’d first caught up with about 5km earlier! Soon we were out on what was theoretically tarmac under the snow, and at the top of the broken road. There was a 35 points down the hill. When we got there we were both frozen and my teeth were chattering. We talked about putting an extra layer on but decided to see if the climb back up would be enough to warm us up. I was looking at another 30 point control and debating the bike / run balance, but then decided no, not worth it. I warned Elizabeth we had a long fast road descent which would almost certainly be unpleasant and not in the slightest bit ‘warming’. As we crested the top in silence, the blood was coming back into my hands and I was groaning with the pain. I think it was as nothing to what Elizabeth felt as we came into transition. With a recently healed broken collarbone and a still not happy broken finger, her whole arm was going through some sort of torture. We grabbed our stuff, got out of the field and dived into the hall. I heard later that we were not the only ones to nip inside! I couldn’t help with the pain so got on with sorting out the run map, where all the score markings had washed off. The most important thing when we went out would be to keep moving, so this was time well spent nailing down where to go. After a toilet trip (me) and half a cup of hot water (both of us), we were ready to go back outside. 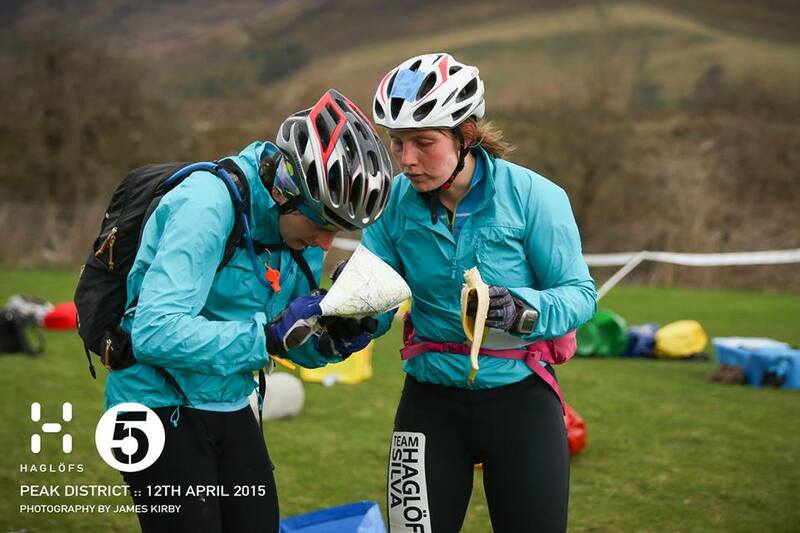 Bizarrely, I still wasn’t really hungry and I think I only ate a couple of bananas all race. Within 20 mins of the run, the gloves were off and sleeves rolled up. Running is really a magic body warmer-upper! 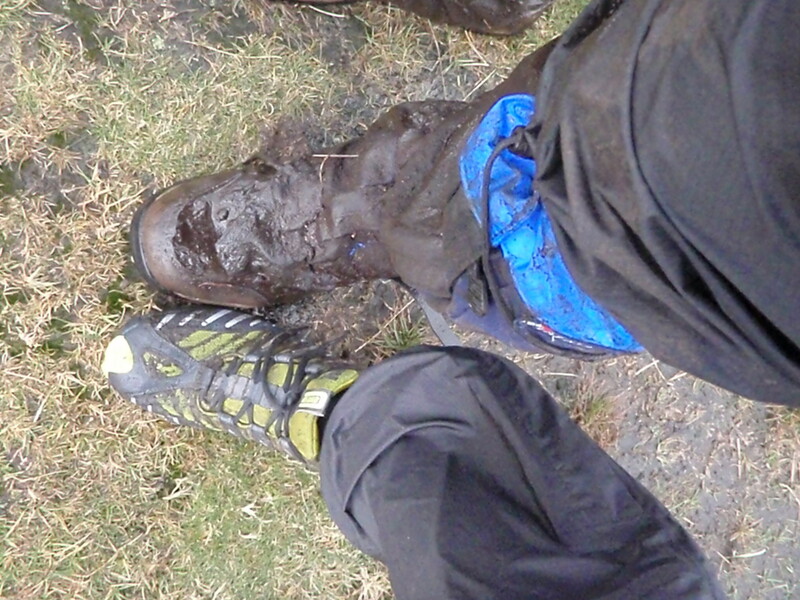 The first part was an easy, if sometimes muddy, run in the valley. The map had a slightly awkward distribution of scores, but we had agreed before that going up worked better for us than running fast on the flat. So we committed to up, taking the fast route on the road we had so recently descended. Onto the ridge and we had met my calculated ‘cut off’ for diving over the top for a sneaky bonus control at a small quarry worth 15. Back up to the ridge and after we had cleared the slippery steps to the trig point, the running was glorious. We had snow and views and were making great progress. Although it seemed a long way to the next control, it was totally worth it as we dropped down, searching for the right tree. We crossed muddy fields too, but the best bit of the run was up on that hill! Then it was a cruise back to the road and a couple more controls before heading with a little sprint into the finish chute. Less than 4 mins late, 8 penalty points, the 15 had been worth it! Having started last, we also got back last and had barely downloaded and grabbed some chilli and hot tea before it was prize-giving time. As some of the other classes were called out before ours, we realised we had a good score. We won the female pairs, but also came 9th overall, a rare feat! Results here. It only reinforced my belief that ‘bad’ weather races favour me 😉 Biking first was definitely the right choice, especially when trail conditions unexpectedly deteriorated, as we were able to cut short without over-running our planned time too much. The art of keeping moving and not letting our pace drop after map checks was good discipline. We probably also took fewer risks … which paid off this time! We regretted our laidback departure, as upon leaving the snow was coming down again. We couldn’t get out over either of the passes towards Manchester and ended up diverting via Sheffield and Leeds … Um .. Not the plan. We did discover though, that you can get a good curry and rice at Wetherby services, and I introduced another person to the pleasure that is Rheged services, just off the motorway at Penrith and easily overlooked. I just missed a train in Glasgow and had the joy of waiting on the platform with the other assorted 23:30 passengers before finally making it home just before 1am. Think that is a record! Another great race from Open Adventure. Thanks to them, to Elizabeth for agreeing to come with me and doing the driving and to James Kirby for pictures. 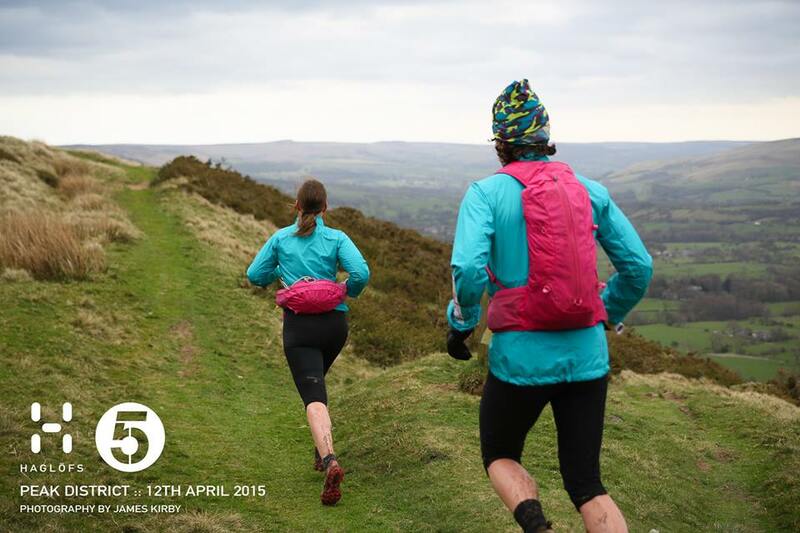 The final of this winter’s Open 5 series was in the Peak District. Practically ‘home ground’, as Lucy grew up near here and Andy lives ‘just over the hill’. Unfortunately Andy was away working on Saturday, so I came down and stayed with Lucy and her dad instead. I was annoyed to have forgotten to take my Feed Zone Portable snacks out of the freezer, but Lucy had some recipes and ingredients for other treats. I was also suffering from muscle complaints. A sore shin had appeared on Monday (I thought ‘what would Graham (the physio) do?’, the answer: rest, ice, gentle massage), plus an achey hip and a funny back muscle getting out of the station. I was getting paranoid, but had a happy evening chatting and constructing what were, in effect, homemade Nakd bars. Soon I had forgotten about aches and pains and it was time for bed. Next morning I woke up and the first thing I noticed was a parched and sore throat – uh oh! We set off almost on time, but still had to park in the slightly more distant parking area. The map was interesting and we had quite a bit of discussion about it. We also debated what to wear (cold in the wind, warm in the sun, rain forecast later) and engaged in our usual faff. We did manage to set off a little earlier than normal, but not much! We also decided to stick to ‘tradition’ and ran first. Lucy has obviously much recovered since the previous two races as we were speeding. I was back to my usual position i.e. following. But I was keeping up and enjoying the trails. We had what felt like hundreds of little gates with latches to fiddle with and stiles to clamber over. I paused to avoid Lucy’s trailing leg each time and then scampered after her. We only had two minor hiccups. First, Lucy’s plaits fell out! This is the only time we’ve had ‘hair issues’ in a race, though I was also keeping my buff on to keep mine in place as I really need a cut! Next we made one small nav error, quickly corrected but to the puzzlement of a couple with a dog. We ended up running past them three times 😀 . We chose to go for an ‘optional’ 10 pointer, adding about 1km to our run. Just after that we caught up with two guys on a stretch of road. One of them clearly decided to race us and picked up the pace. Lucy responded and I came up next to her. His pal was getting left behind. We did not slow. I thought: ‘you’re just leaving your partner behind, and did you know we can comfortably keep this up for another hour?’. As we crossed a stile into a field, they both disappeared behind us and we had a little chuckle about it. Sorry guys! The hill was tough, but the ridge was fun with the wind behind us. I tripped for the second time in the race and sprawled onto the ground, my map blowing across the hill in the gale. Luckily Lucy caught it and we were off again. Down the final hill my knee was a bit sore and I became more cautious. Lucy had to wait. But when we got to the road we were pushing along to the final control. We came in after 2h9mins. A little longer than planned, but not unreasonable and my shin had been fine :-). I’d had a few looks at the bike map on the way as I was concerned about getting caught at the end. We wanted to go round clockwise to enjoy the best descents and the easier (better surfaced) climbs. But this meant leaving a committing big hill at the end. After a quick discussion, we made a decision before we set off to drop a control early on. Did someone say ‘team’ ? On the first very steep hill, Lucy stormed up whilst I got off and pushed a bit. “Good effort!” I shouted, but Lucy responded “I’ve got other issues now!”. Put delicately, we had some severe ‘lady pains’ to deal with. Cruising and downhills were fine, but efforts were impossible. Sadly our first aid kit had no pain killers, so we are very grateful to the fellow competitor who gave us some paracetamol whilst Lucy rolled on the ground in front of a bemused photographer. A technical downhill that had me walking more than once cheered Lucy up a bit, but some more on-the-floor manoeuvres were carried out whilst we waited for a mountain biker to rummage in his bag for Ibuprofen. He couldn’t find them! So we carried on and implemented use of the tow on the uphill tracks and on the roads. We were making fair progress now and feeling more chipper, but decided to miss an awkward control for 10 points involving extra climb and instead bombed along a road. About 10km to go, an hour left and our average speed so far was over 13km/h. Looking good! Unfortunately, halfway up the next hill it started raining. We came out of a small valley onto an open, flat and exposed moorland just as the heavens really opened and the wind got up. We were battling straight into the gale and were staring at the tarmac under our wheels as hailstones clattered off our helmets. I knew we had to turn right when the bike computer said something-point-two km, just after some trees on the left. But we couldn’t check to see the turn off by just looking up, and we seemed to be barely inching forwards. I managed to stay upright (I’d already been blown off once, earlier on) but we were both having trouble riding in a straight line. Eventually we got to the control in the corner of a wall. We decided to duck down and throw our coats on even though we were already soaked to the skin and ‘nearly there’. It helped, but I went from ‘OK’ to shaking with cold. Suddenly we felt we had to get back very urgently. We knew we’d now have to miss an accessible control on Mam Tor and just return as soon as we could. There wasn’t even any debate. Hands were frozen and on the next uphill headwind section Lucy couldn’t even hold the tow. I tried to push her instead but it felt like a loosing battle against the elements. Scientific studies show that swearing can make you feel better, so we turned the air uncharacteristically blue until we turned with the wind and headed downhill for the final run back to the big yellow finishing arch. Shame we didn’t have a view like this on our way back! We actually came in 3:40 minutes late, despite missing a control at the end. Thank goodness we’d also chosen to be slightly conservative earlier on!. But oh how we’d wished we’d set off earlier in the morning 🙂 . The finish area was almost deserted and the marshals told us people had been bailing out early. We’d had no choice! We rushed to the car but had to ask someone else to undo our buckles to get at the keys. I haven’t been so cold all winter. After a rapid change and some hot veggie chilli I was feeling better, but excessively tired! We won our category, came 11th overall again and won the series. Full results here. I also think we had one of our best ever runs in an Open 5 together. When I got back home I was feeling a bit ropey and by Monday morning had a full blown cold. That would explain the sore throat and some lacklustre training the week before – but I’m just grateful it didn’t arrive a day earlier! 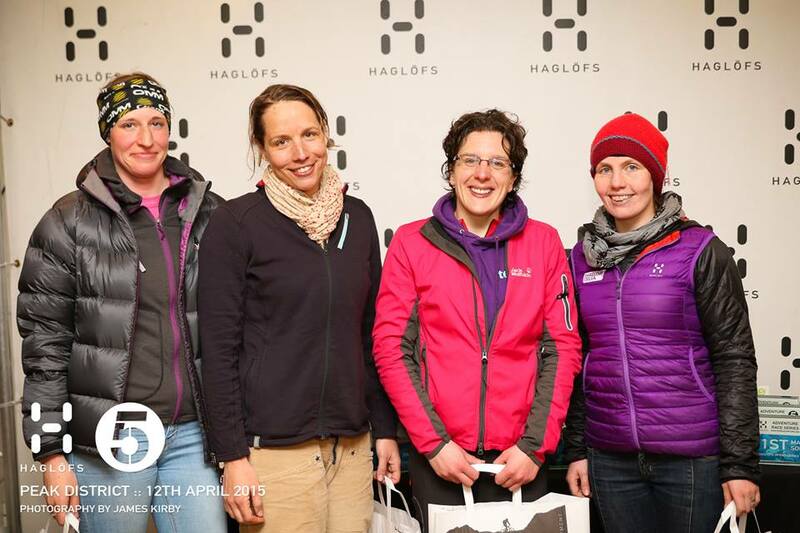 Thanks to Haglöfs for sponsoring the series, their kit is really great for outdoor adventures. 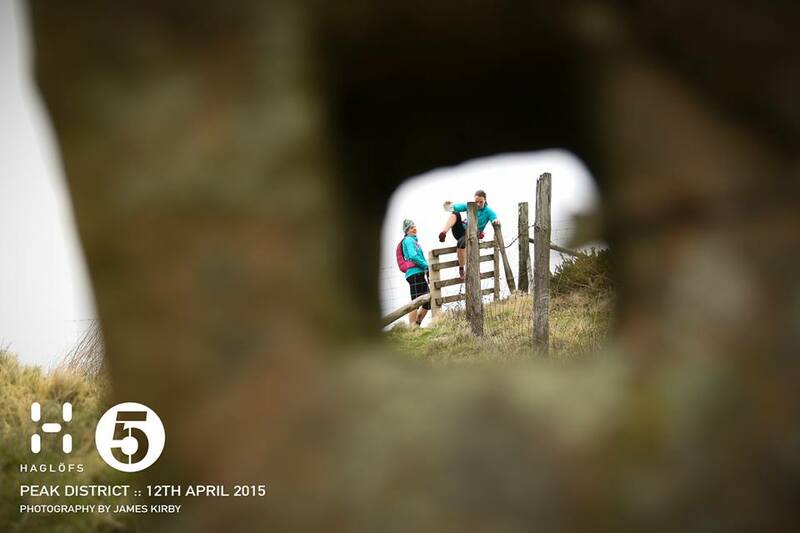 Also to Open Adventure for the events, James Kirby for photographs and all the marshals and course setters. Looking forward to the next lot already! Just about warming up, wearing almost all the dry clothes I had with me. To sum this race up: sun, hills, friendly locals, roads, prizes and my best ever supporter! 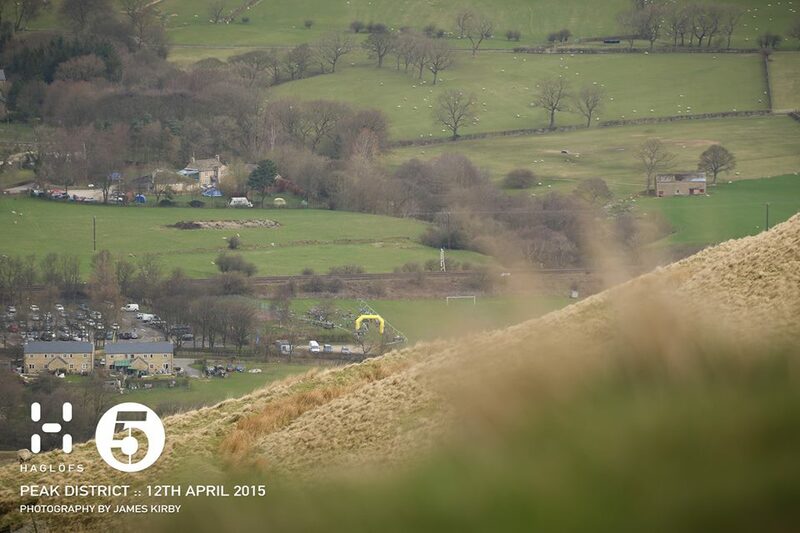 The race was in the area known as the ‘white peak’, starting at a little village called Alstonefield. This is in between Ashbourne and Bakewell and less than an hour’s drive from my mum’s house. Having taken a long weekend off work, we went out for a recce on Friday. Whilst my mum pottered up and down the Manifold Way on her Brompton, read a book, ate ice cream and found where the river had disappeared to, I hauled myself up and down a 53km figure-of-eight loop with 1135m of climbing. It was handy to stop back at the car in the middle to have lunch with her in the sunshine! I did my best to seek out every little bit of bridleway and byway and pack it all into one ride :-). By the end of the day, I thought I might have guessed the map area the wrong way round – portrait instead of landscape. As it turned out that was the case, but I’d had a rather fun ride anyway! Some further map study at home on Saturday made up for it. For me, this kind of ride is all about getting a feel for the topography and the terrain of the area, plus putting my head into ‘mountain biking mode’. This race was going to be the decider for the series, and I didn’t even know if Lucy was doing it! I was a bag of nerves. This showed when we nearly left the house without my bike wheels! Thank goodness I went back in for just one last trip to the toilet and saw them sitting in the hallway! I kept an open mind on whether to run or bike first. After looking at the map I decided to get a good strong bike in first again. It was a different course to usual. Lots and lots of road riding. To the east there were a few low scoring controls – but after going out to collect a little clutch worth 40 there didn’t seem much point missing the others out, so I blasted along and collected the lot – a first for me! Looking at my heart rate graph afterwards I noticed a general dip in the middle. Maybe I unconsciously dropped my effort a little, something to watch out for. I haven’t got any more scientific than that though! I forgot to pack any Nuun (a sports electrolyte-only drink i.e. no sugars) and couldn’t find any in the buzzing metropolis of Lichfield. So at 9pm the night before the race, I had decided to resort to the internet to find a ‘home-brew’ recipe. I would make this the race when I tried out a return to a carbohydrate-containing sports drink! Andy says this will be essential for the Celtman. I’m a scientist, so after reading several suggestions, I went with the modal average. Sort of. It tasted OK! Help, I can't decide which way to go! It was a hot day though, and by the time I got to transition after 63km I was already a bit dehydrated. I gulped down some water and set off on the run. I‘d already planned a likely loop when I was cycling up the last hill. It felt hard going and slow. After three controls, I got into a total dither about which of two options to take. I kept thinking “Don’t take any silly risks!” In the end, I decided it was an acceptable risk and set off in a determined fashion, collected a 15-pointer and nipped across the river Dove, just by a spot where I swam once :-). At this point total confusion set in. I crossed a wall, but thought it was the one 500m further up. Which meant the control I thought was 100m away was actually 600m away – I was having a panic! It was all totally clear looking at the map in retrospect, but I think the dehydration was messing with my normal thought processes. 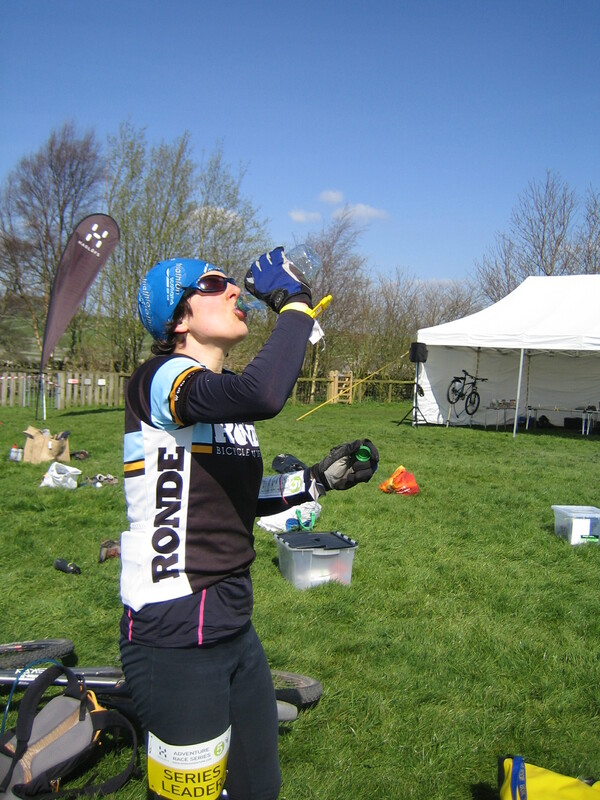 Why didn’t I drink more of the water I was lugging round with me?! Should have done a bit more of this! On the plus side, the locals here were the friendliest I’ve ever encountered in a race. Some were cheering and clapping, people were telling me the control was on a tree ‘just up there’ and others were commenting on my ‘series leader’ label. Earlier on, one group of cyclists told me to ‘just follow them’! Shame they weren’t going my way ;-). However, it was 4.5km to go. I told myself that in the Celtman, I would feel much, much worse at the end – so I had better get on with this as it would be good practice! After that, I felt better; I ran at a consistent pace and was smoother with the navigating. Still, it didn’t stop me getting back over 6 minutes late – 14 penalty points! Gargh! I got 506 points – my third score over 500 this series. I didn’t know if it was enough though, especially when I saw Lucy at the finish! I was left on tenterhooks as the female solo category was last in the prize giving. When it was finally announced I was so happy – I won the race and won the series :D.
Lucy did well, got a good score despite a dodgy hip and moved up to second in the series, with this event’s course planner, Karen McDonald getting series third. 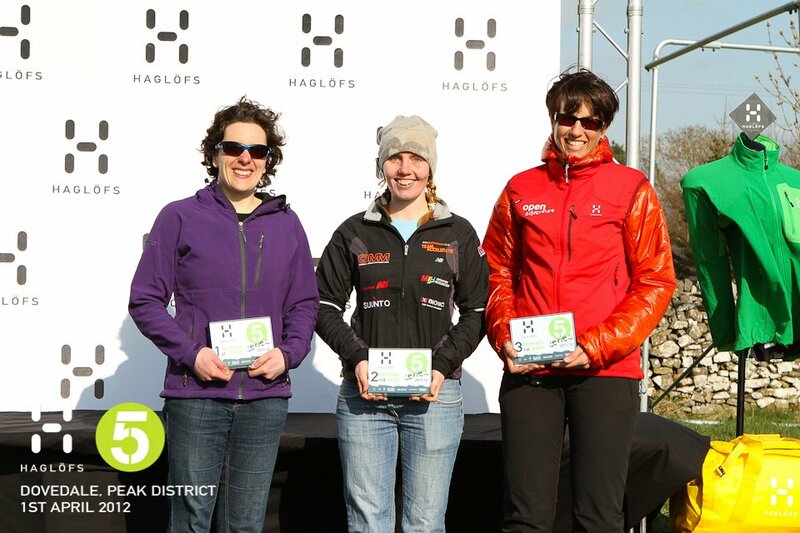 I also proved I can do a half-decent race even when the weather is nice! Finally, I got my bottle of champagne for getting 5000 points ever in Open 5 races, and a special Haglöfs gift for doing all 7 races this series. It’s not easy staying fit enough to race every month through the middle of winter. I started with a twisted ankle and no run training, progressed to a muscle strain in my leg, flu, and some mysterious virus that left me wheezing for a month. But I don’t care, because in amongst all that I also got in some great riding and running, learnt from a few mistakes, experienced loads of new places, made some great friends, and achieved something that eluded me last year! I came up with the following route, which was perfectly executed. Catch a train to Glossop, as early as you can. This involved me getting out of bed, so we set off just before 10am. Walk up “Doctor’s Gate” assessing it for mountain biking suitability on a later date. It’s a bridleway but I fear there would be rather too much pushing for my liking, in both directions! Stop out of the wind for a pleasant first sandwich and piece of homemade fudge brownie. 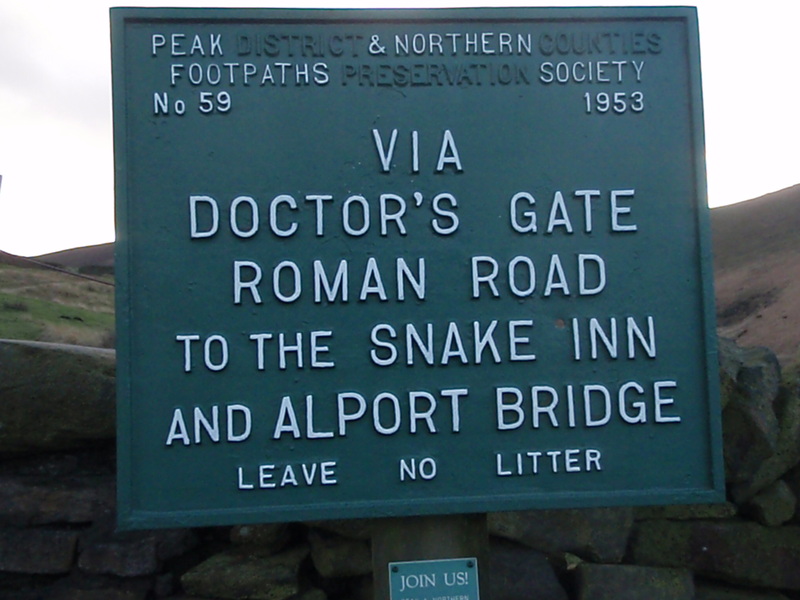 At the top, where this Roman Road joins the modern Snake Pass, turn left and follow the Pennine Way through a peat bog. You go from a rocky little climb to an engineered walking highway, which still has its charms as the path literally bounces, you splash through rivers and stare down into dark little pools. At Bleaklow Head, bear left into a biting westerly headwind. Stop to put on spare jumper, even if it means taking off two other layers first. Get to where two rivers meet and the path crosses them in a little gorge. Take shelter and eat second sandwich and brownie as quickly as possible. Stop every 10 minutes for the next hour to re-tie shoelaces, because hands are too cold to properly carry out a task requiring such fine motor control! 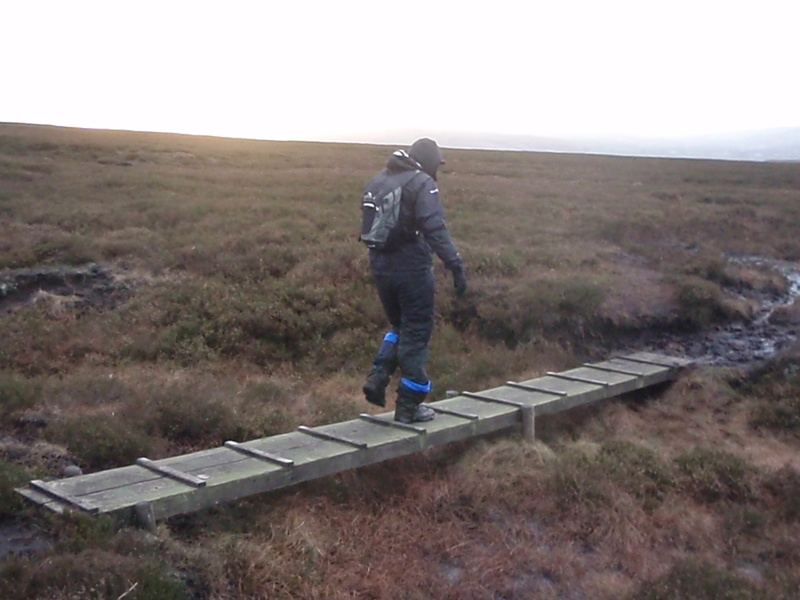 Locate the left turn-off from The Pennine Way, which starts with an exceedingly deep boggy bit – let someone else find that out first! 😀 The map gives clues to the terrain … all those spidery blue lines on a flat moor! It is wet, but the path is punctuated by helpful wooden bridges and walkways. Cue your best Billy Goats Gruff impressions; “Trip trap, trip trap! Who’s that trip-trapping over my bridge? !” Try not to jump too far out of your shoes when someone sneaks up behind and says “Boo”! Descend back towards Glossop on a double-track, taking a shortcut to Swineshaw reservoir that gets you stuck at the top of a small quarry. Really, either the ground did not match up with the map here, or I was too fuddled to figure it all out. Allow Andy to take one last photo – this time of a pig. Get back into town just before dark and grab a sweet hot drink and emergency third sandwich in the café before heading home to tea and curry*. * I had made a tasty shepherd’s pie but confused the paprika and chilli powder – oops! Second mealtime around with all the (non-spicy potato) gone, it went well with chickpeas, a tin of coconut milk and plenty of rice!